A London court has sentenced seven people to between six and nine years in prison after they were convicted of smuggling migrants across the English Channel. 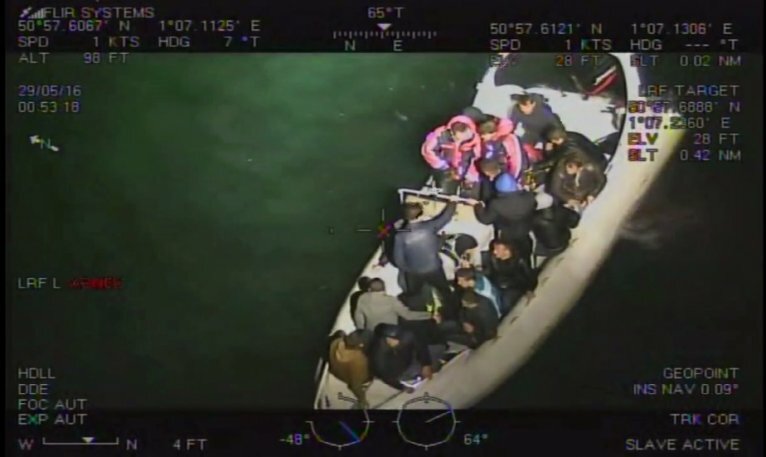 The gang, consisting of Albanian "travel agents" and Brits with very limited boating experience, charged migrants a staggering €7,000 each in a plot to bring them over in inflatable boats and on jet skis. The gang targetted migrants stuck in Calais desperate to make it across the channel at any cost and risk. On September 21, the Central Criminal Court of England and Wales convicted the men of people smuggling, handing them sentences of between six and nine years in prison, adding up to a total of 48 years. The investigation showed that Leonard Powell, a British family man from Kent, was involved in the smuggling business with the help of his two sons, George and Alfie, as well as two Albanian nationals, Saba Dulaj and Artur Nutaj, and others. Between April and August in 2016, the ring used inflatable boats to make several disastrous crossings between France and England. The gang charged each migrant some €7,000, and the judge estimates they made a profit of up to €110,000. "The Albanians recruited people of their own nationality [in Calais], they acted as travel agents of sorts,” Marc McCormack, a senior investigator at the National Crime Agency, was cited as telling French daily Le Parisien. "They] acted as some sort of a ferry company that could bring them over," he said. On May 11, 2016, British investigators find an abandoned inflatable boat containing life jackets on Dymchurch Beach in southern England, some 75 kilometers from Calais. The navigation system indicates that the boat has just crossed the Channel. The investigation also shows that the boat has been acquired by a certain Leonard Powell just a few days earlier. After being alerted by their British colleagues, the French police then put the group on surveillance also on the French side. During this time, the gang commits a series of amateur errors. On May 26, 2016, French police spot a boat that is approaching the beach of Escalles, a few kilometers away from Calais, as a group of 17 people wait on the shoreline, ready to embark. The captain, Albert Letchford who had bought the boat together with George Powell a few days earlier, appears to be alerted about the police presence and manages to turn the vessel around at the last minute. Two days later, on May 28, 2016, George Powell tries to bring 18 people over in a boat that he owns, named the “White Scanner”. Bad weather and the amateurism of the crew, however, complicates the journey, and the British coast guard ends up coming to their aid. “They were out of fuel at sea,” Mark McCormack explained. “The migrants called us saying they were drowning. Two people in charge of the crossing were wearing life jackets, but none of the passengers were.” The boat, which was made to carry six people, had as many as 20 migrants onboard. On July 26, a vessel belonging to the smugglers is spotted going in the opposite direction of the maritime route. Once again, the boat runs out of gas and ends up being towed. "No one had the qualifications to operate a boat and the vessel was doing circles on one of the world’s busiest shipping routes," Mark McCormack said. According to British newspaper the Independent, one gang member even enters the wrong satellite navigation code at one point, using the postcode for France instead. “That just shows the level of incompetency of the crime group,” McCormack said.